On the back of increasing urbanization, the market for personal care products have been expanding which is expected to propel the market for oral care products over the forecast period i.e. 2019-2027. Increasing personal disposable income and growing geriatric population are some of the major factors estimated to boost the market shares robustly in upcoming years. The WHO reported a rapid rise in geriatric population from 7.64% in 2010 to 8.7% in 2017. 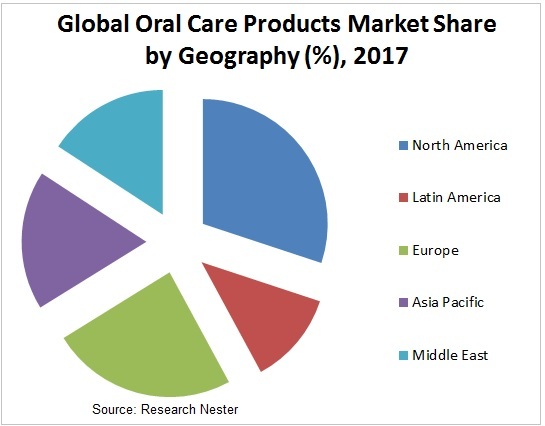 On the basis of regional platform, the global oral care products market is segmented into five major regions including North America, Europe, Asia Pacific, Latin America and Middle East & Africa region. Asia Pacific is anticipated to display a vibrant growth showcasing the highest driving rate on the back of growing geriatric population, rising disposable income along with rise in dental tourism especially in countries like India, Singapore, Thailand and others. Further, North America is estimated to hold the highest shares on account of prevalence of highly health centric aware population across the region with presence of major market leaders allowing easy penetration in the market. Europe is expected to display a vivid growth on the back of increased usage of technologically advanced oral care products across the region during the forecast period. On account of increasing awareness regarding oral hygiene across the developing regions around the globe, the oral care products market is anticipated to expand over the forecast period. Rising urbanization along with increasing disposable income of the present population is estimated to display a vibrant growth of the market across the globe. The global GDP percent growth has been observed to increase from 2.51% from the year 2012 to 3.15% in the year 2017. The increasing urbanization is leading to higher awareness rate regarding personal hygiene which is expected to propel the growth of the market around the developing economies of the world. On the back of rising social media endorsements and growing importance of oral beauty, the demand for teeth whitening products has considerably increased which is anticipated to expand further during the forecast period, impacting the oral care products market positively around the globe. The increasing demand for improving personal care esthetics and rising availability of new attractive products offered through constant R&D of the major market players is estimated to drive the market significantly. Changing lifestyles accompanied with the adoption of modernized care products is estimated to accentuate the market growth vividly during the forecast period. Increasing dental infections and caries due to high consumption rate of unhealthy food, smoking and increasing incidences of dental periodontal diseases collectively are attributing to the growth of market across the globe. Further, the increase in the inclination towards cosmetic dentistry and the latest technologically improved product offering range along with growing consciousness among the current population about their physical appearance are the key factors that are driving the dental care products market. However, lack of standard reimbursements and frequent product recalls along with limited adoption rate of technologically advanced products across the under-developed regions around the globe are estimated to serve as the key factors in restraining the growth of the oral care products market over the forecast period. Johnson & Johnson Consumer, Inc.